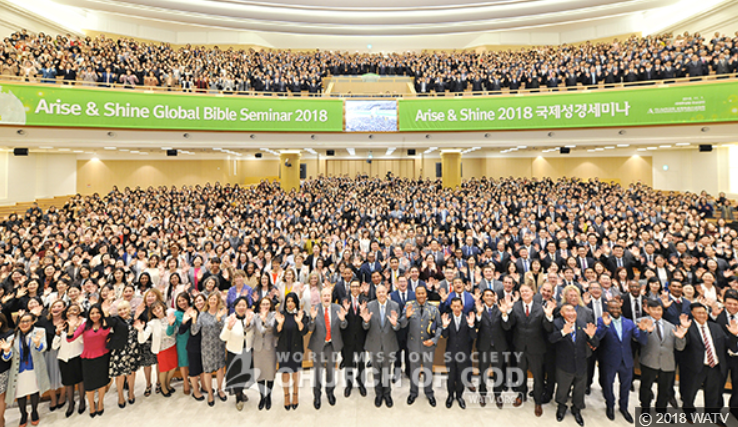 The World Mission Society Church of God (WMSCOG) held the ‘Arise & Shine Global Bible Seminar 2018’ on November 1 at the New Jerusalem Pangyo Temple in Bundang-gu, Korea. This global Bible Seminar is now getting a lot of attention for its topic about God the Mother. Experts from all over the world visited Korea to prove the existence of God the Mother through this seminar, in various aspects such as science, engineering, medicine, cultural art, etc. The seminar was divided into three sessions consisting of ‘Will in all creation and Paradigms, Science and Medicine, Cultural arts and Engineering’, and seven experts from United States, Spain, Peru, Philippines, Mexico and South Africa proved God the Mother in depth. On the spot, about 2,500 people, including 140 people who visited Korea from 25 countries, domestic believers and guests from all walks of life, participated in the event. Pastor Kim Joo-cheol (WMSCOG) said, “Today’s seminar is designed to help all human beings know God correctly and move on to the path of salvation” , and “We hope that this seminar will bring about a beautiful change in your life”. This entry was posted in God the Mother and tagged arise and shine global bible seminar 2018, Christ ahnsahnghong, elohim god, eternal life, god the mother, God the Mother Beliefs, God the Mother Bible Truth, god the mother church, god the mother in korea, god the Mother youtube, heavenly mother jerusalem, Jerusalem mother, Mother Jerusalem, prophecy of the Bible, source of water of life, truth of wmscog, wmscog, wmscog heavenly mother, wmscog sermon, world mission society church of god beliefs. Bookmark the permalink. I’m so proud of being a member of the World Mission Society Church of God. Me, too. All the experts reveal the existence of God the Mother in their own field. So clear! It is such a good news cuz the truth of God the Mother hidden in the Bible must be spread to the whole world for the salvation of mankind. Everyone knows that mother and life are inextricably linked likewise we can never think of our eternal life without God the Mother. WMSCOG is truly leading the world into right way! if WMSCOG leads all the people around the world, world will go on well! It is amazing. In various field, many of experts prove the existence of God the Mother. I hope that all people realize this truth. Nowaday, The truth of God the Mother becomes a global concern. The Glory of Mother spread to the whole world! We can understand the existence of God the Mother from all things around us created by God. Our life is given to us by our physical mothers. In the same way, our spiritual life is given to us by our spiritual Mother or God the Mother. It’s a very good seminar that is opportunity to know about truth of God. Amen! A lot of people have fix idea that God is only one as God the Father. However, the Bible very clearly testify that we have God the Mother as well as God the Father. The Bible testifies about the Existence of God the Mother. In addtion, the Experts of various fields from all over the world testifies too that God the Mother exists. Who can deny this fact? It is good issue to talk about God the Mother. Which church can discuss that title except church of god with science? Sounds like it would have been a really interesting Seminar. Lots of interesting speakers and topics. The last secret of the Bible is God the Mother who will give us eternal life. It means all humankind need to know God the Mother. It’s awesome!! WMSCOG is the best church. It’s so great that the experts in different fields proved the existence of God the Mother in various aspects! Of course, it is the most important fact that the Bible itself clearly proves it!! Yes, the Bible itself clearly testifies about the existence of God the Mother as well as God the Father. Through this seminar, we can understand that various evidence testified about God the Mother. It was a big seminar! Great! Only the World Mission Society Church of God (WMSCOG) blieves in God the Mother based on the Bible. We can also understand the existence of God the Mother from what has been made by God.